Simon & Schuster, 9781476705767, 208pp. Comedian Mike Birbiglia’s hilarious New York Times bestseller is now a major motion picture co-written and produced by Ira Glass (This American Life) that IFC Films will release in theaters and through Video on Demand in August—starring Birbiglia and Emmy-nominated actress Lauren Ambrose (Six Feet Under). 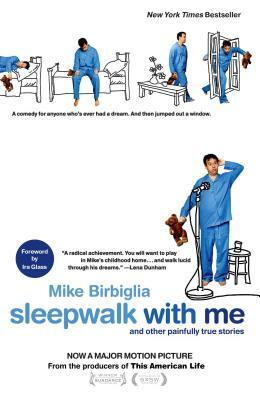 Sleepwalk with Me is a comedic memoir, but I’m only thirty-two years old, so I’d hate for you to think I’m “wrapping it up,” so to speak. But I tell some really personal stories. Stories that I considered not publishing time and time again—about my childhood, about girls I made out with when I was thirteen, about my parents, and, of course, about my bouts with sleepwalking. Bring this book to bed. And sleepwalk with me. Mike Birbiglia is a comedian, author, actor, and director. His one person shows Sleepwalk with Me and My Girlfriend’s Boyfriend have both run successfully off-Broadway and toured internationally. He was a finalist for the Thurber Prize for American Humor for this book and his feature film adaptation of it won the NEXT category’s audience award at Sundance Film Festival in 2012.